1. Bathrooms are not in rooms this year. Corridor bathrooms with private shower stalls and private toilets are provided. There are three bathrooms on our floor...one for girls, one for boys, and one for staff. 2. Check-in is 3-5pm but the earlier you arrive in that window the better. You will have time to settle into your rooms before the camp meeting, dinner, and evening rehearsals. 3. Camp itineraries will be available at check in. Roughly, doors are open at 7am then stretching at breakfast. Field rehearsal lasts until lunch. Music rehearsals take place in the afternoon. Free time is before dinner. After dinner, we are at the field again until around 8:30. Social events are at 9 M-Th and members are in rooms by 10:30 with lights out at 11pm. 4. 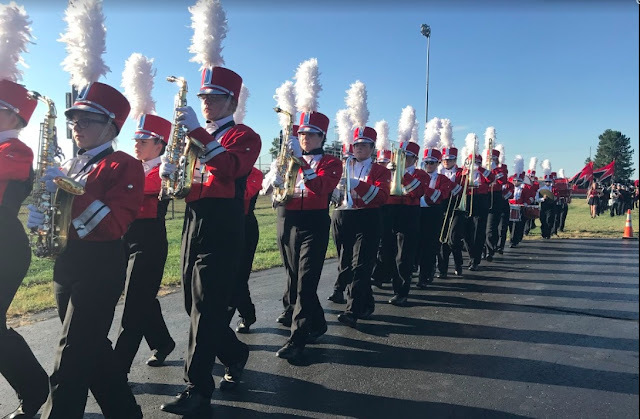 If there is anything you left in the band room and need for camp, the band room will be open Friday 10-noon and Sunday 8am-9am. *Emergency medical form. Copies will be available at check in if you did not get one last week. 6. Make sure you bring your own linens - sheets, blankets, pillows, towels. 7. Parents are reminded that the end-of-camp show is at 5pm on Friday and check out is immediately after.